Earlier this week, the National Football Foundation revealed its official ballot for induction into the College Football Hall of Fame. The 2015 class that will be announced on Jan. 9 in the days leading up to the national championship game in Arlington, Texas. Seventy-five players and six coaches are on the ballot. The headliners are Heisman Trophy winners Ricky Williams, Eric Crouch and Rashaan Salaam, and current Kansas State head coach Bill Snyder. Other big names on the ballot are Brian Bosworth, Ray Lewis, Randall Cunningham, Eric Dickerson, Warren Sapp and Keyshawn Johnson, to name a few. It is undoubtedly a list loaded with talent. But unlike the Pro Football Hall of Fame, where only a handful of players are inducted each year, the College Football HOF has room for plenty of inductees. Last year, for example, 16 individuals were chosen to enter the Hall. Mark Carrier (USC) — The Trojans have a long history of Heisman winners, but only one USC player has ever won the Jim Thorpe Award as the nation’s top defensive back. That would be Carrier. The two-time consensus first team All-American safety finished his college career with 13 interceptions and a bunch of big hits before being picked by the Bears in the first round of the 1990 NFL Draft. Randy Hughes (Oklahoma) — A key member of the Sooners’ undefeated 1974 national championship team, Hughes picked off 14 passes in college before going on to a five-year NFL career with the Cowboys. Hughes was named to the 1970s version of the Big Eight’s All-Decade Team, and a year before the once-powerful conference disbanded in 1996, Hughes was named to the All-Time Big Eight Team at strong safety. Buddy McClinton (Auburn) — He still holds the school record for career INTs with 18, nine of which he collected in his senior season. That same year, McClinton was voted All-American at safety. He was also the MVP of the 1968 Sun Bowl. Dennis Thurman (USC) — The defensive coordinator of the New York Jets was a two-time All-American safety for the Trojans who also spent a little time at receiver and punt returner. As a senior in 1977, Thurman was USC’s Defensive Player of the Year and team MVP, capping a career that included two Rose Bowl wins and 13 interceptions. He played cornerback for the Cowboys and Cardinals in the NFL. Scott Woerner (Georgia) — Only safety Jake Scott (Super Bowl MVP for the undefeated ’72 Dolphins) has more interception return yards as a Georgia Bulldog than Woerner, and Champ Bailey may be the only UGA cornerback better than Woerner. 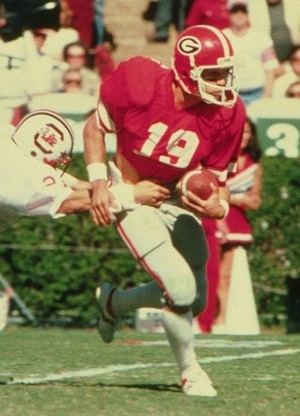 The All-American’s signature moment was his fourth-quarter interception against Notre Dame in the 1981 Sugar Bowl that sealed a national championship for Georgia. Woerner played for the Falcons and Saints in the NFL, and for the two-time USFL champion Philadelphia Stars. It’s an impressive group of some of the best DBs the college game has seen, but … just five? At first glance it seems like a low number, but if you split the 75-playor ballot among eight position groups — quarterbacks, running backs, receivers, offensive linemen, defensive linemen, linebackers, defensive backs and specialists — that would give you about nine players per group on an evenly distributed ballot. So it’s not a total travesty. It’s just how things shook out this year. And when you consider that the 2015 ballot also has just five quarterbacks, well, that puts a damper on any accusation of a systematic blind eye being turned to a traditionally overlooked position group like DBs. It’s actually refreshing that this year’s College Football HOF ballot has 15 linebackers, 15 D-linemen and eight O-linemen sharing space with those five QBs. Quarterback (5) — Tim Couch (Kentucky), Eric Crouch (Nebraska), Randall Cunningham (UNLV), Cade McNown (UCLA) Antwaan Randle El (Indiana). * Paul Crane, a two-time national champion at Alabama in the mid-1960s, is on the ballot as an offensive lineman and linebacker.